Do you want a place to take classes or hang out after school? Do you love pickup sports or game nights? We don’t currently have a single community center serving Braintree, Brookfield and Randolph. We do have many community places and spaces , offering many exciting activities. So how can we improve them, fill gaps, and make them more accessible? We need YOUR input and ideas! Take our quick survey here, or scroll down to read more about the project and how to get involved. This project is a community-driven effort, led by volunteers from Braintree, Brookfield and Randolph. Take our online survey and watch for comment boxes around the three towns. Gather with an organization, a group of colleagues or neighbors, and have a chat. We’ll give you a simple kit with discussion questions and a reporting form so that we can include your group’s ideas. We welcome more volunteers and people to help with outreach or events. Get in touch and find out how you can join. Where did this idea come from? Why not a physical community center? 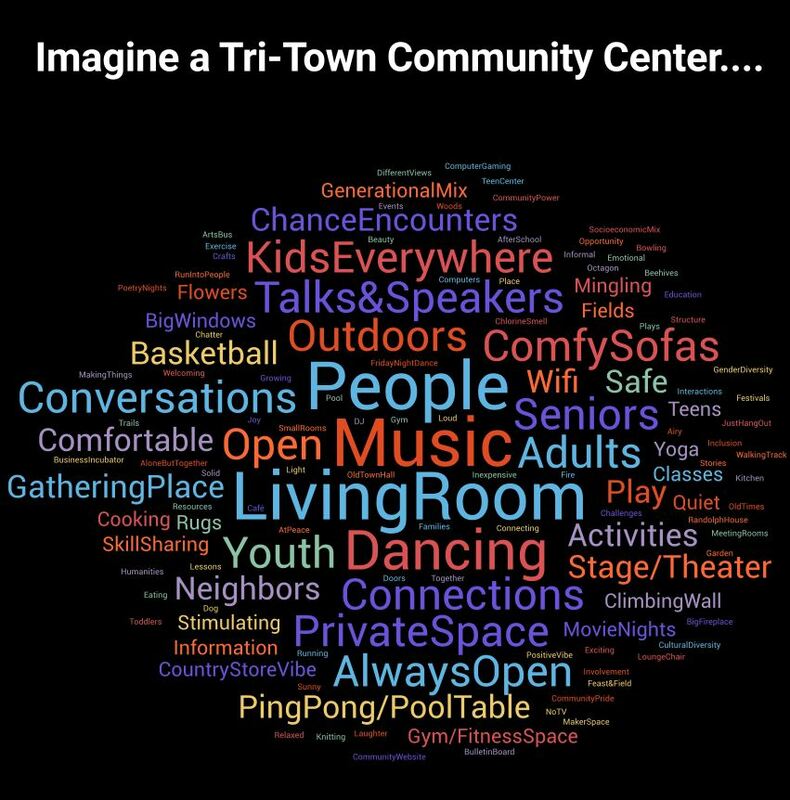 The idea of a community center has come up in numerous community planning conversations over the years. A group of community leaders meeting from 2014-2016 recommended building a community center to support growth and community development. When the Randolph Village fire house burned in 2016 and the town needed to bond for a new one, it became clear that the town likely couldn't fund a traditional community center facility in the near term. 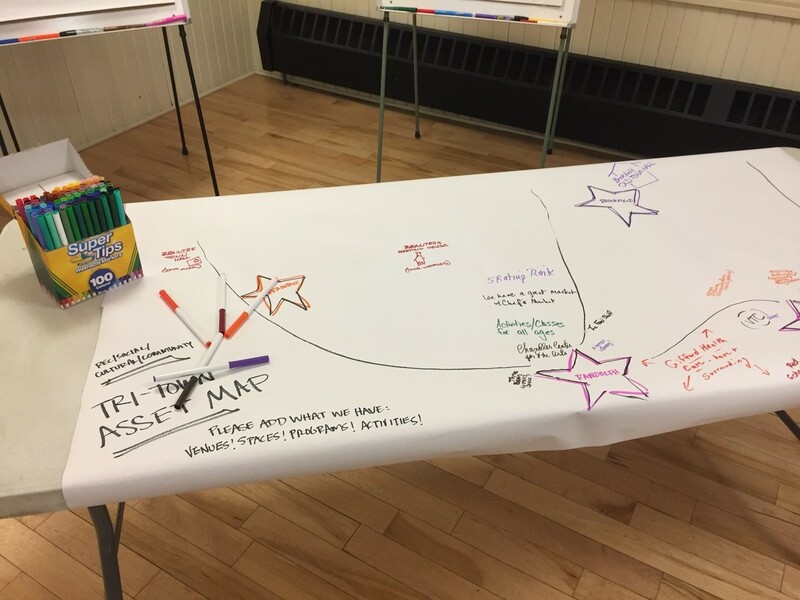 The group realized that many community places and spaces are already serving the purposes of a community center and applied for a Vermont municipal planning grant through the Town of Randolph to explore ways of connecting and better utilizing them, and better understanding community needs. This is a first step. We will use the results of surveys and community conversations to develop a set of recommendations, which we’ll share at a community Open House in May. We’ll then develop a final report and ideas for longer-term activities or improvements. If there is significant interest, the group will then outline next steps (including seeking funding or support) to start taking action. What have you heard so far? We held a kickoff workshop in January, where more than 40 area community members came together to talk about what community places & spaces are already working well, where we have gaps, and how we could develop creative solutions to improve them. Click On the infographic below to see what they discussed. This project is made possible by the generous support of many volunteers and several key programs.